EPNS Bowls, Silver Plating Bowls, EPNS Brass Bowls. We are manufacturers of EPNS Bowls. These EPNS Bowls products are embossed with various attractive patterns. These products impart a royal look of the dining table. Moreover, the traditional and contemporary designs carve on these products are highly applauded by clients. Decorative Bowl Sets available in Whole sale prices. FOOD CARVING TROLLEY OF SILVER. We manufacture good quality bowls which are attractive in design. This EPNS fruit bowl is made with flawless finish. The flaunting curves and clean cuts make a sophisticated design with lasting looks. 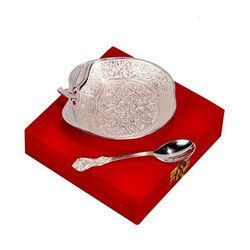 Matching up with the ever increasing requirements of the customers, our company is engaged in providing 24 Carat Gold Plated EPNS Bowl. This is a beautifully crafted Brass EPNS capsule set consisting 2 bowls, 2 spoons 1 tray. Silver plated with Lacquer coating. A perfect corporate gift as well as high end personalized gift. Size:6. 5"h x 10" dia. 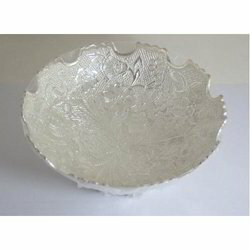 Description: Beautifully carved EPNS bowl in leaf & grapes design. These bowls prevents the rottening of the fruits.